Are you shopping for you or your baby’s benefit? Let’s be clear: It’s about both of you. 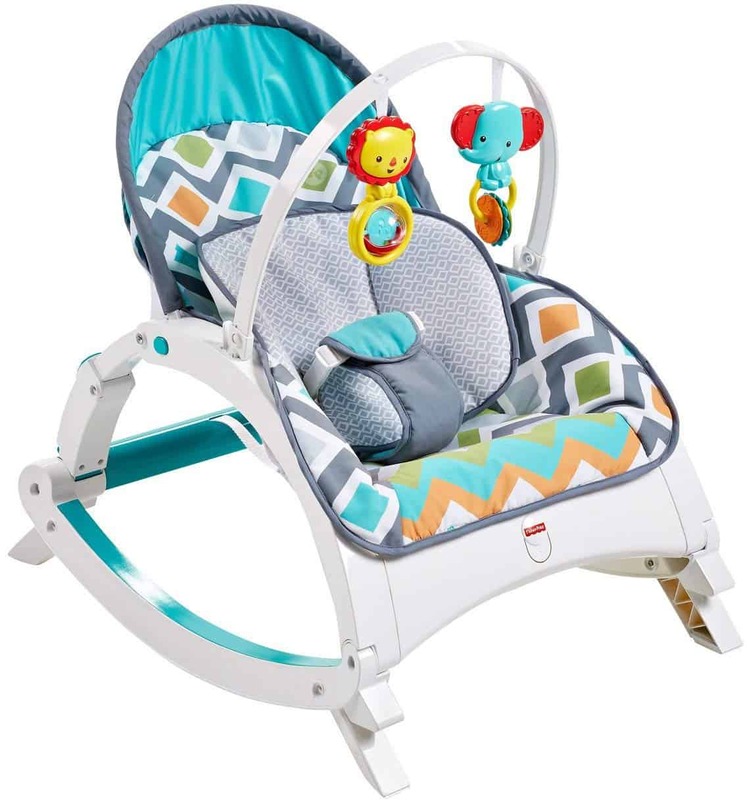 If the baby bouncer seat helps lull your baby to sleep you have a few more minutes to tend to important matters or make the next bottle. Your baby is more stimulated and doesn’t feel frustrated because he or she can’t she what’s going on. So it’s a win win situation and we’re going to help you vet some of the best baby bouncer seats 2018 has to offer. As mentioned above a baby bouncer seat is not simply a luxury item. It can help make your parenting days easier and go as far as help with your baby’s development or be a remedy for reflux. Let’s run through some vital features to show you why an infant baby seat must be on your wish list. Your ideal seat will be designed to afford support to your baby’s body with no chance of him or her rolling off onto the floor. Even if it’s placed on the floor most of the time you can never take a chance of your baby getting hurt. So picking a well designed model is essential. If the seat meets this requirement you can go about your tasks with your baby near you, but you won’t have to keep your eyes focused there the whole time. If you find seats that allow for some excellent viewing from an elevated position it’s worth the money. Your baby is curious about what’s going on around him or her. 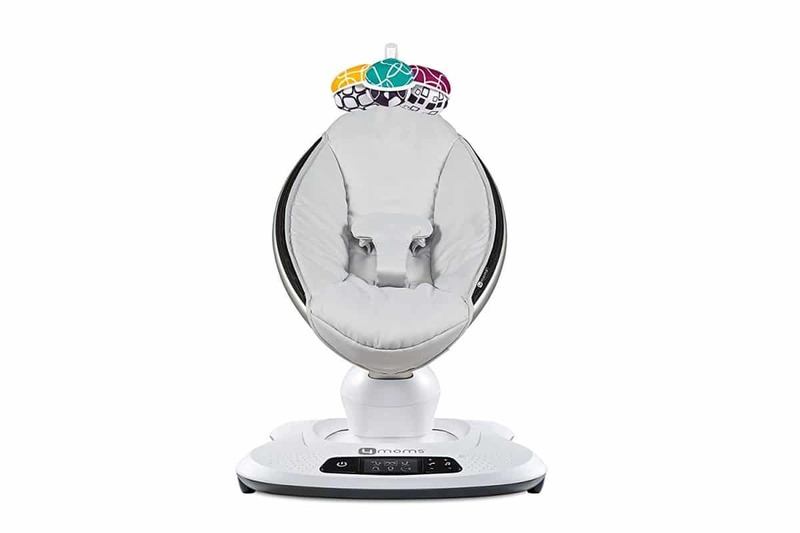 The bouncer seat is already better than making your baby feel isolated in the crib all the time. However—especially when they get older—kids will cry to see more of the goings on. The more view value you provide the happier your baby will be to stay in the seat for long periods. Is it stable so it won’t topple? What prevents baby from falling forward or out? Did the manufacturer use safe fabric that won’t cause rashes? Do you only need this for the first few months after birth or do you need a long term solution until toddler years? What look do you want; must it fit in with your home décor? Will you have a travel version too to keep in the car or are you buying one that must be portable so you can use it everywhere? Do you want to spend money on all the extras such as toys or will you provide that yourself? Combine the list of necessary features with your budget guidelines and pick the best option from the list below. Why we like it: This is like having a nanny on demand which will rock your baby to sleep when your to do list is long or you simply don’t have energy. 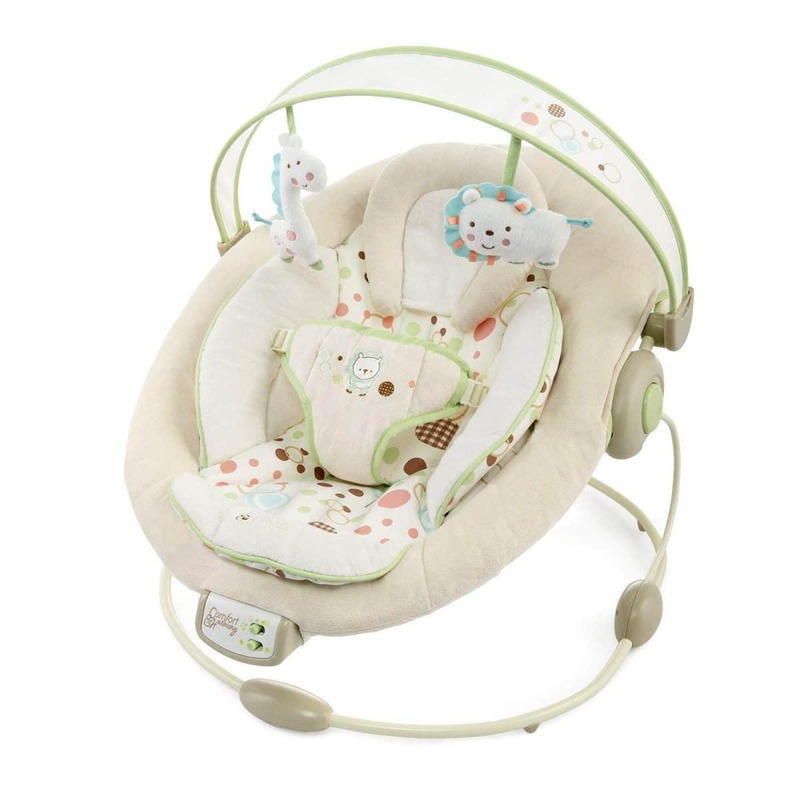 With many different settings and motions you can pick the ones your baby loves best for customized rocking times. This includes bouncing up and down which mimics adult movement. It’s important not to risk your baby falling out when he or she starts moving around on its own. This unit is a bit heavy at 19lb and with the mounting unit at the bottom it’s more difficult to pack than folding units. The exterior of the seat is made of nylon fabric. This can easily be wiped down or even placed in the washing machine. You can also play MP3 tracks thanks to the plug in feature. The seat can be adjusted and colorful objects above will keep baby occupied. The soft area is covered in nylon fabric. Why we like it: Sometime the best options are the simplest ones and that’s why this basic design is near the top of our list. The design has been approved by doctors as a supportive bouncer option so you know you’re giving your baby the support it needs. The seat also distributes the weight which makes baby more comfortable. It’s not a power driven model but uses the baby’s own movement and weight to lull him or her to sleep. This also gives the baby a chance to learn about balance since they can control it with their movements. It measures 36.4” x 15.5” x 4.4”. 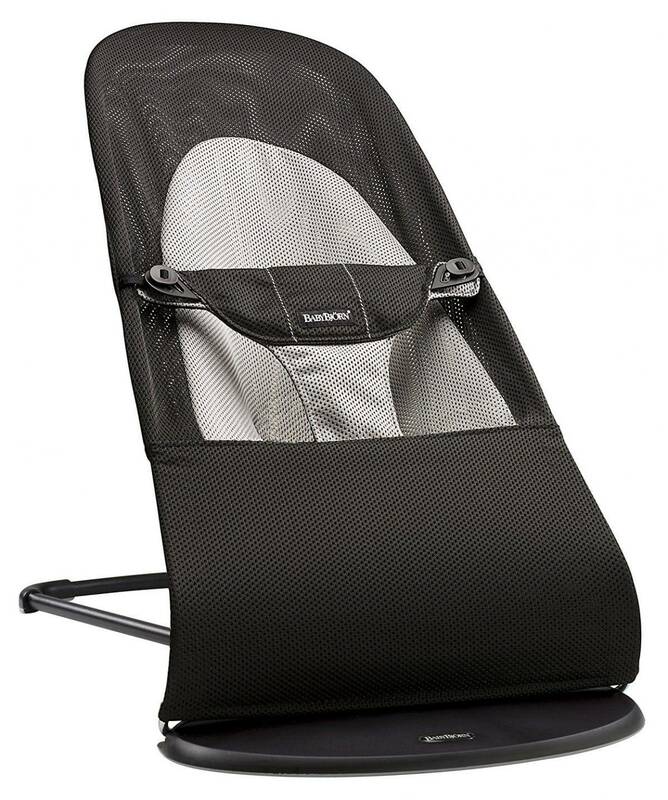 It has a special fold up setting which makes it easy to take with you when you travel with the baby. You can put it in the washing machine since the cover is removable. All the materials will dry easily and the mesh allows for airflow so it dries quickly. A toy rail is available but sold separately. Why we like it: Who doesn’t want to lie in this adorable little bed? There are enough colors and toys to keep baby busy even if he or she is not in the mood to sleep so parents can continue with their other responsibilities. This model offers a diverse range of features so it’s safe to say you’ll find something your child enjoys. 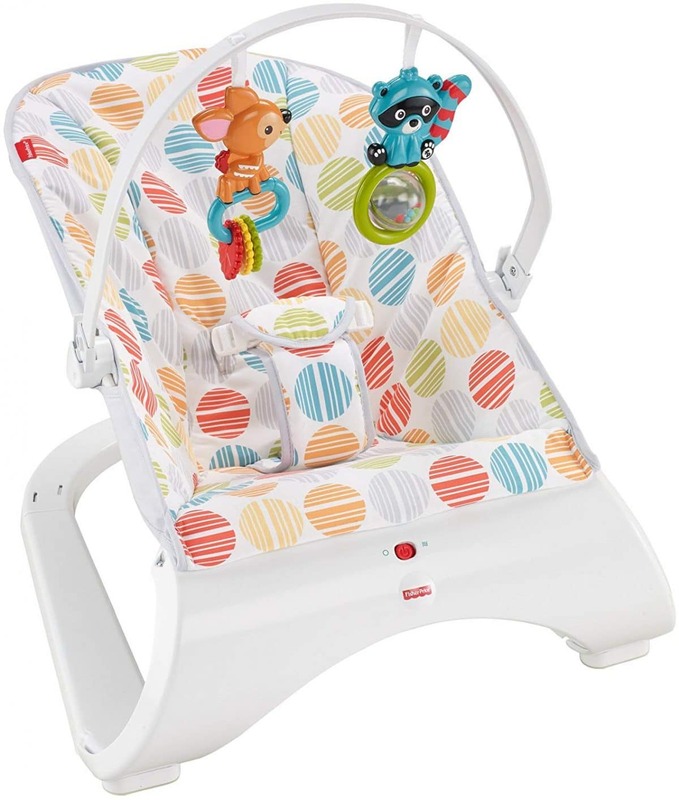 This includes different swing settings, reclining positions, speeds and sounds. Your baby’s comfort is looked after since you’re provided with inserts. You can adjust the seating as your baby grows. You can power the sound and movement with a cord or batteries. You need to have this space available in the room: 35.04” x 44.02” x 37.01”. Only suitable up to the age of 6 months. It’s advisable to stop using it if the child starts crawling or weighs more than 25lb. This is quite bigger than some other units on this list and its size means it’s not the most portable unit. It also weighs 24.9lb. This is quite heavy even to carry around the house but it adds to its stability. The seat component is removable so you can place it elsewhere if you don’t need your baby soothed such as keeping your baby stationary during feeding time. You have a plush surface you can wipe or even put in the washing machine if necessary. As part of the toys—three soft plush animals—you’ll see a mirror which is great for entertainment but also mental development and a way your baby will learn about itself. 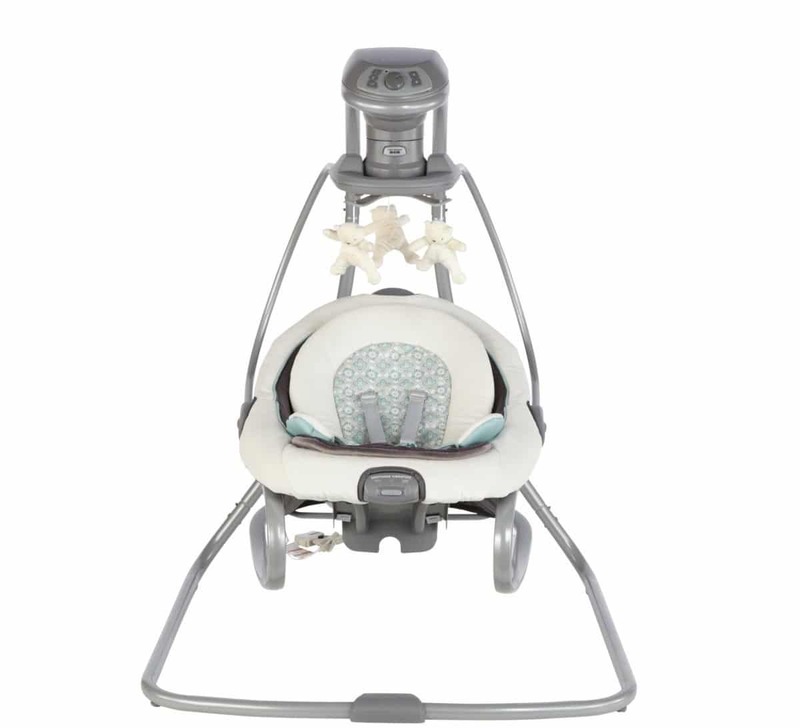 Why we like it: This unit ensures your baby stays safe because it has a five point harness which is what you usually find in car seats. 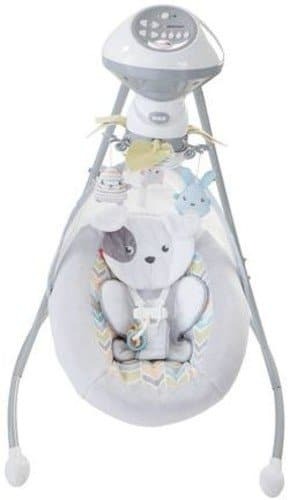 No way baby will fall out which is a good thing since this is also a swing which means the seat is elevated off the floor. A sleek design and so practical. We love multi use products! This isn’t only a swing you can use for optimal soothing. The seat can detach and become the rocker you can keep close by while you tend to other tasks. The seat even has a carry handle so you can transport your baby easily. If your baby is sleeping soundly, why wake him or her simply to go to another room? This is another large model at 30.8” x 24.5” x 36” and it weighs 17.9lb. 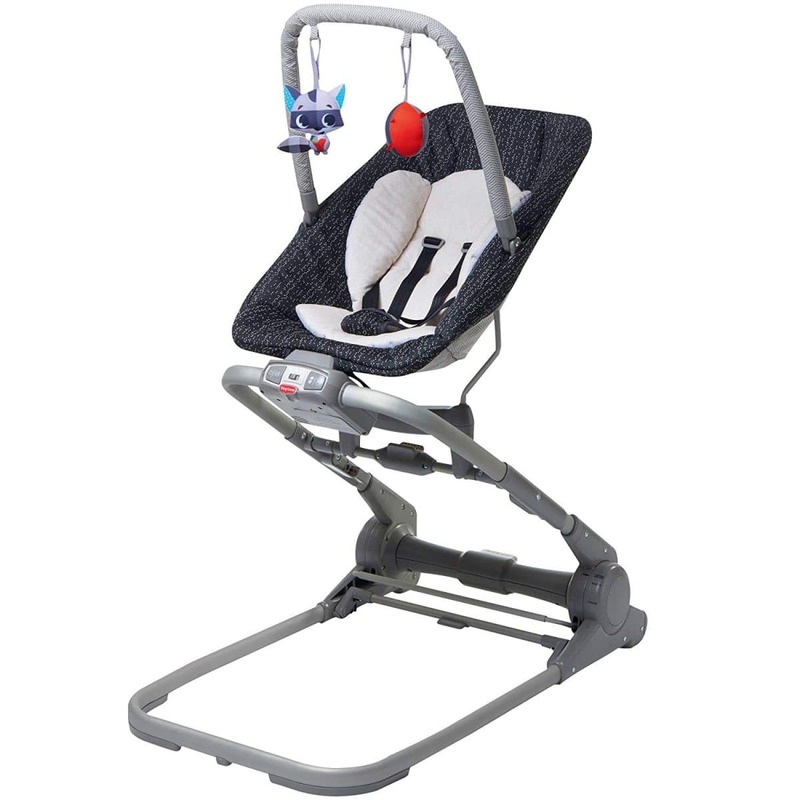 The swing is suitable for babies weighing between 4lb and 30lb. If you use the rocker only, please don’t use for babies that weigh 20lb or more. The seat makes for easy portability around the house but you won’t necessarily find this an easy unit to take with in the car. It’s a bit bulky although the snap in features make for easy setup. The frame can be wiped down with any soap and water but be careful how you wash the rest as it’s not detergent or bleach friendly. You can only use cold water and delicate cycles so you can’t exactly put this in with your regular washing. You get toys, sounds and movement in one unit. Not only a seat but a swing too. The seat is made of cloth which you can wash.
Why we like it: It’s amazing to think technology has come so far that you don’t need a bulky unit to get all the benefits you want. This compact unit allows many features without taking up all the space in the baby room. This is another handy two in one unit because it makes for a perfect place to sleep but can also be a seat to play in when baby wakes. The seat is designed according to a comfortable incline which is appropriate for most babies to sleep in. You’ll love the mesh used in the design as it keeps baby from getting too hot. Your baby will feel comfortable as all fabrics are soft and baby skin friendly. You’ll power this with an AC cord and then it can play one of 12 songs or three audio effects. It will also automatically rock at one of two speeds. At only 1lb and 22.8” x 32.3” x 24.4” this is one of the easier models to move around the house. You can place babies weighing up to 25lb inside this unit. Mostly appropriate for babies up to six months old. The weight and size makes it portable around the house and it does fold up for easy storage or transport. The plastic unit can be wiped down easily and the cover can be removed to wash. Just beware: Don’t use softener. No toys included. If your baby is particular about which items he or she responds too at least you won’t pay for items you won’t use. Unfortunately it’s difficult to keep toys from falling on the floor if they’re not fixed to a bouncer seat. The fabric is soft to the touch and mesh is used to create airflow. Why we like it: It’s the chair for every occasion because you can adjust the height to suit your needs. Whether you want baby near the floor or joining you at the table you now only have one chair you need to work with. It’s also super portable. This looks so huge and complicated but I think it’s worth giving it a chance. It’s actually designed in a unique way so you can easily store it and set it up. To keep baby happy you can pick from many entertainment settings which include music, vibrations and toys. At its smallest setup it measures 7.88” x 32.88” x 19.88”. Thanks to a padded insert you can make it ultra comfortable even for newborns. This is designed for easy portability so simply collapse the unit to put it in the car or store it away. Just note it weighs almost 18lb which is a bit on the heavy side. The frame is easy to clean with a cloth as it’s all simple piping. The fabric parts are washable even in your machine. Wheels at the back of the frame help with easy manoeuvrability around the house. You get a five point harness to keep baby safe which is very necessary for a seat that can adjust to such a height. Why we like it: We love it when manufacturers remember those small details that matter and here you have non skid surfaces on the bottom. With these your baby’s chair won’t slide off the counter because he or she moves around a lot. It’s the Comfort Curve because your baby will feel much at home in the uniquely designed seat. 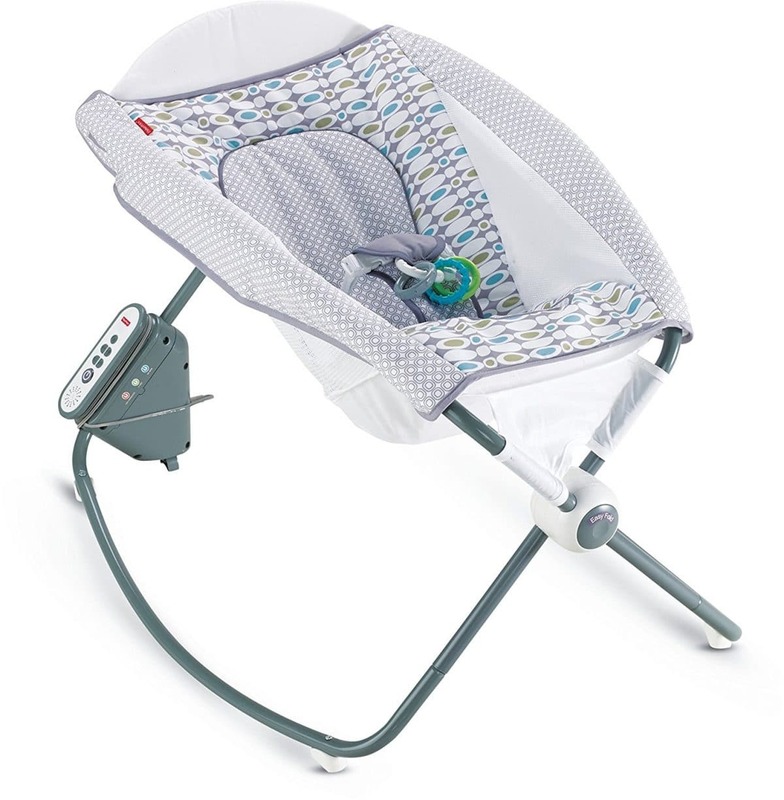 The seat is also soft which will help baby fall asleep while vibrations soothe him or her. It comes in a pleasing design that doesn’t spoil your home’s style and the compact design doesn’t take up much space. Removable parts—such as the toys—allow you to customize it to your use at a given moment. And there are safety features which are so handy and something you don’t find on all bouncer seats. You need a D battery to power features such as the vibrations. The dimensions are: 21” x 16.5” x 4.5”. You can use this until your baby weighs a maximum of 25lb or is a maximum of one year old. Thanks to the harness it’s safe even to put tiny babies inside as long as they weigh more than 6lb. It’s light and compact though it doesn’t fold up completely. It’s easy to fit this in larger cars and around the house you can easily move the 1lb unit even with baby in your arms. The seat pad is machine washable and the rest can easily be wiped with a wet cloth. The toy bar—with two toys attached—is removable which means you can remove it when it will be bothersome such as during feeding time. Soft cosy fabric which is gentle on babies’ skin. Why we like it: This is such an all in one with everything from baby appropriate looks to different features in terms of motion and sound. Even in terms of weight it’s light in comparison to some other similar models. If you’re unsure what exactly you want this could be a great compromise unit. There’s a toy bar to entertain baby but this you can turn so it’s out of the way when you’re busy feeding or tending to your child. It weighs in at 7.76lb and the size is 23.5” x 24.5” x 23”. You can use this for any baby weighing 25lb or less. Setup requires some effort so it’s not the easiest thing to take down, take with you in the car and assemble on the other side. However it is light enough to carry easily so if you have space to put it in the car as is it’s a great solution. Wipe down the poles and you can remove the cover to wash it. One of the only units on this list with an auto shut off feature which means after baby fell asleep you don’t even have to manually turn off the sound or movement; everything is done for you. Another thing you don’t find often is both head and foot rests. With this you can make it more comfortable for smaller babies and remove them once they’ve grown. The fabric is soft and washable. Why we like it: Perhaps you’re looking for something you’ll be able to use a little longer than 12 months. That’s smart if you need to manage your budget and then you can turn to this handy seat. You can change it according to your child’s growth so you can use it far longer than most bouncer seats. This doesn’t have many power operated features but it can rock on the stand and when you need your baby stationary you simply use the kickstand. That’s so user friendly! For those times you do need some help to soothe it has a vibration feature. While it’s big enough to be a comfortable seat for toddlers up to 40lb it’s still ultra comfy for babies too. The large space means they won’t feel cramped and so sleep peacefully. To add comfort you can use one of the three reclining positions. It’s an acceptable size of 24” x 19.7” x 23.2” so it doesn’t take up too much space in the house. It’s battery operated and can vibrate for up to 60 hours on one set of two C batteries. Use it for any child lighter than 40lb and simply make adjustments—such as not using the harness—depending on the age of the child. Even newborns can be safely strapped in with the three point strap component. The unit is designed as a mobile, portable chair so you can fold it completely flat to load it into the car or store it away. It weighs only about 8lb so anyone in the family can quickly load it where you need it to go. The cover is not only machine washable but afterwards you can even put it in the dryer. This heat ensures your baby’s seat stays hygienic throughout the years you use it. You can attach the rail with toys to keep baby entertained. Taking this away makes it appropriate for any sized toddler. Washable fabric and fabric straps to keep baby secure. Why we like it: You don’t only need a bouncer at home; you especially need one when visiting others or going on holiday. This one gives you an easy option to take it wherever you may need a seat because of the minimal assembly necessary and how compact it becomes when folded. This is compact and light so you can handle it with one hand and it will fit in your baby room no matter how small your home is. 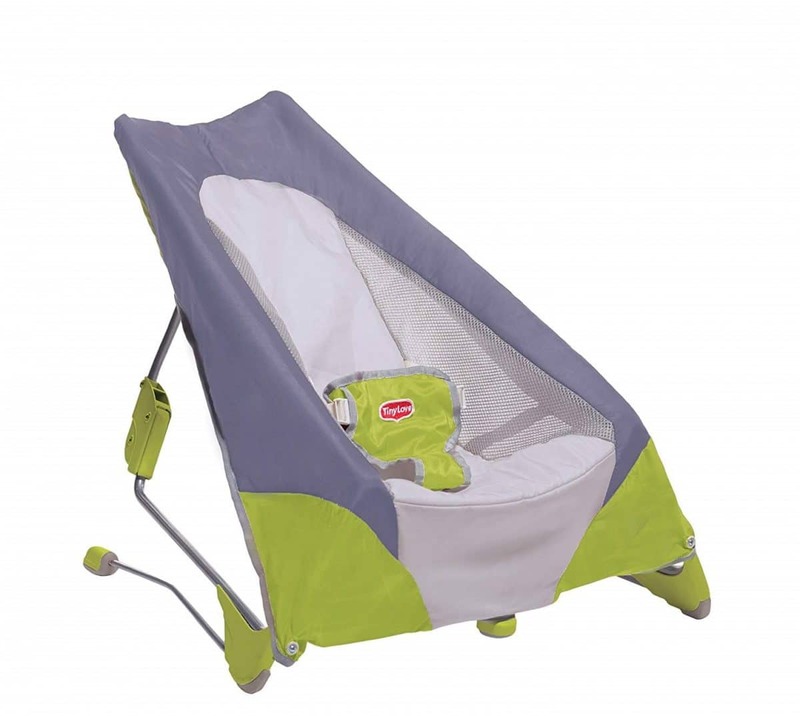 It’s very affordable but still showcases a stunning design so it will complement all your baby equipment. Of course it doesn’t afford the comfort of some of the more stuffed units mentioned here but if you need a practical, light solution this is still an excellent bouncer to try. It weighs a mere 4.8lb and it measures 23.7” x 13.8” x 4.2”. It’s light and small enough to handle even by a mother who is still sore after the birth. Despite its simple design it will handle weight between 8lb and 29lb. This bouncer can fold up and there’s even a carry bag so you know it won’t get damaged or hook onto other fragile items you’re transporting. Smooth fabric you can wipe down and the seat pad is easy to clean in the machine but you can’t use detergent or tumble dry. Smooth fabric and washable seat pad. In these reviews you saw many different features and perhaps you like the two in one designs as much as we do. But what are these types and which ones do you actually need? Bouncers: This one is for when baby is awake. The motion is intended to keep your baby stimulated and entertained. They will also feel less constricted in terms of movement so they will probably be happy staying in this type of seat while watching you going about your day. This is not the sleeping type of seat. These don’t necessarily need power since the bounce motion can be generated from the baby’s movement or you nudging the chair. Rockers: Here the movement starts mimicking what you probably do the moment you want your baby to sleep: Rock from side to side or forwards and backwards. An important thing to note is that babies must like the rockers you buy them. You know all babies aren’t lulled in the same way so you may purchase a perfectly good rocker only to find your baby prefers other motions. This is why it’s smart to purchase one with a return policy. These units are usually more pricey since they need electrical components to generate the movement. Swings: Here the goal is also to put your baby to sleep with more elaborate movement—generated by an electrical motor—that produces a swinging motion. If your baby struggles to fall asleep but loves snoozing in the car this could be a dynamic solution in the house. Nothing you buy for your baby should ever be taken lightly. Safety and comfort is too important when it comes to tiny humans so let’s summarize your checklist when you’re out shopping. Make sure safety is optimized with items such as harnesses and read what consumers say about the seat’s balance. You don’t want it to topple over. Don’t think toys, sounds and movements are overrated. They’re investments because this is what will keep your baby stimulated or asleep. It’s not the main reason for buying a bouncer seat but with most babies it will make your days easier. And why DIY toys to the seat if you can get one with an attached rail? Always think long term. What will you do when the seat is drenched in milk or all the food was spilled onto it? Washable fabric that can be removed and put in your washing machine should be a high priority. With portable units you often have to decide between comfort and ease of use. You may find a handy unit that can fold up but the seat won’t be as soft and stuffed thickly as others. You need to think about your lifestyle and gauge whether you’ll need this when you travel with the baby. Do you want optimum comfort at home or minimal comfort wherever you go? Yes the idea is to free your hands so you can tend to important tasks you can’t manage with your baby in your arms. That doesn’t mean you can place him or her in the bouncer in the nursery and simply walk out. Your baby should at least be in the same room as you and in line of sight. Your baby may wriggle around and this could affect the seat’s balance or place your baby in a position that’s uncomfortable or even dangerous. Some of the units mentioned her are great because they can be elevated. That’s ideal because you’ll often be tempted to place a bouncer seat on a table to get your baby to eye level. This is not a good idea as accidents happen fast and even stable ones will fall over if you accidentally bump it or the baby moves too much. It’s designed to be placed on the floor and that’s the safest option. The weight details on these chairs are very important. If you exceed it there’s no way of knowing what the bouncer seat will do when baby starts moving. It could tear, it could fall over or your baby’s bum will repeatedly hit the floor as it will be too close to the ground. You don’t want accidents when it comes to your baby. The best way to prevent them is to limit risk and danger in any way possible. Keeping to the rules of baby bouncer seats can give you peace of mind that you’re doing your best as a parent. So many parents report how bouncer seats make their days easier but also their babies happier. The movements and sounds are what some babies need to fall asleep. therefore this could be even more valuable than that beautiful cot you have in the room. Or perhaps you simply want a seat to place your baby in so you can take pictures or entertain them. See? In so many scenarios this piece of furniture makes sense. But remember: Always safety first.